Welcome to the all-inclusive Hilton Rose Hall Resort & Spa. Enjoy a stunning beachfront location on a legendary 18th-century sugar plantation at this Montego Bay Jamaica resort. Relax and refresh with a unique spa experience at Soothe Spa offering seaside modern and historical settings. Gaze out over the Caribbean Sea from the private beach or take advantage of the water sports center at this 489 room resort and spa. Enjoy family fun at the hotel’s Sugar Mill Falls Water Park. Couples and kids love floating down the lazy river. Navigate through cascading waterfalls to experience the thrill of a 280-ft. slide, relax along the lagoons, or refresh with a cocktail at the swim-up bar or poolside cabana. This all-inclusive resort in Jamaica offers a superb food and beverage program led by an award-winning chef. Choose from one of seven all-inclusive restaurants, bars and grills offering casual alfresco dining and Northern Italian cuisine. Play a round of golf at the resort par 72 onsite championship Cinnamon Hill Golf Course or enjoy a game of tennis on one of six courts. Celebrate a special occasion in the resort’s 44,000 sq. ft. of meeting and event space accommodating up to 800 guests or host an elegant wedding at a unique outdoor ceremony site, such as the ancient aqueducts. After an exciting day of discovering Rose Hall and Montego Bay, relax in a comfortable Guest room capturing the warmth and charm of the island with tropical-style features, spectacular views and private balconies in each. Make yourself at home in one of the 45 individually decorated guestrooms. Rooms have private furnished balconies. Cable television is provided for your entertainment. Private bathrooms with shower/tub combinations feature complimentary toiletries and hair dryers. Make yourself at home in one of the 7 air-conditioned rooms featuring Smart televisions. Rooms have private balconies. Complimentary wireless Internet access keeps you connected, and cable programming is available for your entertainment. Private bathrooms with shower/tub combinations feature deep soaking bathtubs and rainfall showerheads. When you stay at Sunscape Splash Montego Bay - All Inclusive in Montego Bay, you'll be on the beach, within a 15-minute drive of Montego Bay Cruise Ship Terminal and Hip Strip. This beach property is 3.7 mi (6 km) from Doctor's Cave Beach and 12 mi (19.3 km) from Rose Hall Great House. 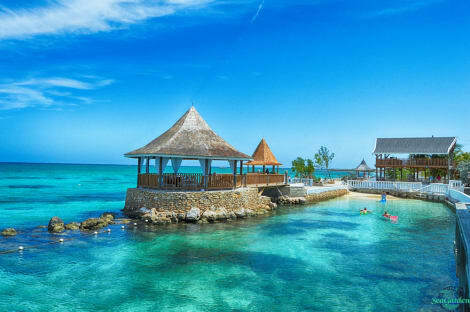 All-inclusive Holiday Inn Resort in Montego Bay, Jamaica. Located less than ten minutes away from the Montego Bay International Airport, the Holiday Inn Resort® Montego Bay Jamaica All-Inclusive Hotelis the best place to stay to enjoy your worry-free vacations. This beachfront hotel provides easy access to local attractions such as the Rose Hall Great House, the Martha Brae River and Dunn’s River Falls. This all-inclusive hotel in Montego Bay offers comfortable accommodations, relaxing spa treatments, a casino, volleyball courts and more. Throughout the entire day, enjoy snacks and delicious meals offered in each of the five on-site restaurants. Choose between thrilling water sports or simply rest in the outdoor pools while your kids have fun at the Children’s activity center. Whether you are looking for exciting vacations or a relaxing time, this Holiday Inn hotel has something for every guest. With a stay at Round Hill Hotel And Villas in Montego Bay, you'll be near the airport, within a 15-minute drive of Tryall Golf Club and Fairview Shopping Center. 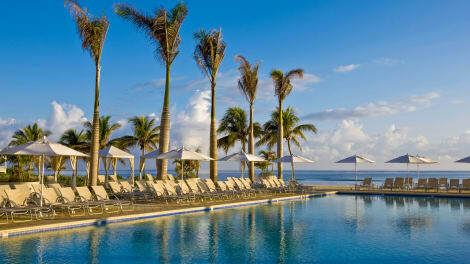 This 4.5-star resort is 8.9 mi (14.4 km) from Montego Bay Cruise Ship Terminal and 9.8 mi (15.8 km) from Hip Strip. Pamper yourself with a visit to the spa, which offers massages, body treatments, and facials. When the sun is out, a round of golf or a day at the private beach are two great options for taking advantage of the fine weather. Additional amenities at this Colonial resort include complimentary wireless Internet access, concierge services, and babysitting/childcare (surcharge). Guests can catch a ride to the beach or shopping on the complimentary shuttle. When you stay at Zoetry Montego Bay - All Inclusive in Montego Bay, you'll be on the waterfront, a 5-minute drive from Montego Bay Convention Centre and 6 minutes from Rose Hall Great House. This 5-star property is 4.2 mi (6.7 km) from Hip Strip and 4.5 mi (7.3 km) from Doctor's Cave Beach. When you stay at Secrets St. James Montego Bay - Luxury All Inclusive in Montego Bay, you'll be on the waterfront, within a 15-minute drive of Montego Bay Cruise Ship Terminal and Hip Strip. This 5-star property is 3.7 mi (5.9 km) from Doctor's Cave Beach and 11.9 mi (19.2 km) from Rose Hall Great House. Montego Bay is the second largest city in Jamaica and a favoured cruise ship destination. It draws in tourists from all over the world because of its spectacular beaches, tropical climate and tax-free shopping. Whether you want to snorkel in the crystal clear waters, sample the Caribbean nightlife, or simply relax and enjoy the tranquil beauty of your surroundings, Montego Bay hotels offers it all. Savour the peace of lapping water as you float languidly down the Martha Brae River. Your raft guide will be on hand to inform you about the local wildlife and fauna you meet along the way. Alternatively, go tubing on the White River through coconut plantations and bamboo groves with your guide. Guided tours are a great way to explore the area, with many different companies to choose from. For a less formulaic approach, where you really get to see the island, try Liberty Tours. If you simply want to enjoy miles of white sandy beach, lined with palm trees and clear water, then Doctor's Cave Beach won't disappoint. With a bar service close to hand, feel free to stretch out on a sun lounger, sip your favourite cocktail and admire the view. For the hustle and bustle of souvenir shopping try Gloucester Avenue. Be robust and go prepared to bargain and you may be pleasantly surprised with what you walk away with. There are also a number of bars and restaurants along the strip, so there's plenty to do and see. For a memorable equine experience book a Turf and Surf session at Half Moon Equestrian Centre and ride the waves on your chosen mount. Alternatively, there's the Half Moon Golf, Tennis and Beach Club for those who want to keep their feet firmly on the ground. For an unforgetSEOSITE_LEVEL_DESCRIPTION natural phenomenon, a visit to the Luminous Lagoon, located to the north of Jamaica is a must. Dip your fingertips into the water and watch it light up around you thanks to the presence of millions of microscopic organisms that react to movement in this startling way. For the intrepid, a trip to the Blue Hole is a real experience. Getting there is tricky due to badly maintained roads, but this little corner of paradise with its inviting gushing waterfall, turquoise pool and leafy shade is well worth the effort. A better-known tourist attraction on the island is Dunn's River Falls, with its 600 feet of cascading water. Learn about the history of the island and the workings of a coffee bean plantation with a tour to the Croydon Plantation. Alternatively, venture to the former sugar plantation of Rose Hall Great House. Wander around the reputably haunted 18th-century mansion with its elegant wallpaper and historic surroundings. For those more interested in perfecting their golf swing, Rose Hall also provides Cinnamon Hill Golf Course, with its challenging sand bunkers and spectacular views of the Caribbean.